While photos of the horrors of war draw viewers into places and events with startling intimacy, it's not often that we think about the photographer beyond that decisive moment. Does she have a family? A circle of friends? Does she live in a house in the country or an apartment in the big city? What would it be like if the situations laid bare for the world to see were hers? "Time Stands Still," in its first regional production since it closed on Broadway in January 2011, turns photojournalism on its head by showing the other side of the camera, it all of its imperfect glory. Susan McKey, Kevin Kelly, Bruce Graham, and Megan McDermott. Photo by Matt Urban. This Delaware Theatre Company production is a partnership with the Act II Playhouse in Ambler, PA, the theatrical home of director Bud Martin. 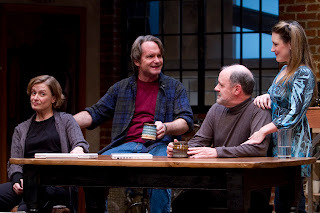 Donald Margulies' vision of an intimate and strikingly realistic slice of one photojournalist's life after an injury overseas works incredibly well on the DTC stage -- it's as if you're a fly on the wall. 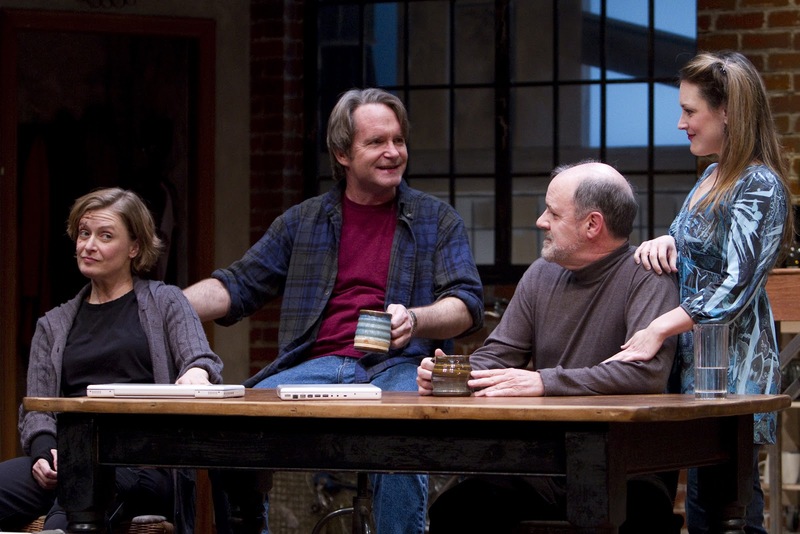 The play features four characters: Photojournalist Sarah (Susan McKey), her longtime partner James (Kevin Kelly), her friend and editor Richard (Bruce Graham), and Richard's young, bubbly girlfriend Mandy (Megan McDermott). The acting is spot on. As you get to know these people, you start to relate to them on different levels (which characters you relate to most depends a lot on your own experiences and personality). Despite the fact that the subject matter is war, with Sarah having been injured in Iraq, there is no heavy-handed political message. It's a story about people and relationships, of love and loss and passion. It all takes place in Sarah and James' Brooklyn loft, beautifully designed by Dirk Durossette. It's not a place you'll soon forget. "Time Stands Still" runs through February 5. For tickets, visit DelawareTheatre.org. For more, see my review for STAGE Magazine.